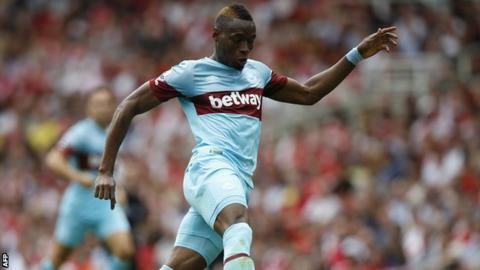 West Ham manager Slaven Bilic says striker Diafra Sakho has been training as normal despite his arrest. The Senegal international was arrested, allegedly on suspicion of assault, three days before starting Sunday's 2-0 Premier League win at Arsenal. "Of course I'm concerned," said Bilic at his news conference before Leicester visit Upton Park on Saturday. "I spoke with him. But he looks very positive, he's not worried about it. I am happy with him." Bilic also confirmed midfielder Morgan Amalfitano is no longer in the first team and explained why West Ham did not sign former England international Joey Barton. Amalfitano was left out of the squad for the opening weekend victory at Emirates Stadium. It was reported that the 30-year-old, who has one cap for France, had missed a team meeting and his manager had made him train with the youth team. Bilic said he has had a "quiet meeting" with Amalfitano, who arrived at Upton Park from Marseille last summer, to explain the situation, adding: "He's not in the first team any more and that is it. "My first job is to protect the team, to keep the team as a unit in the best possible way. "If I feel that someone is damaging it in a way, I have to react - and I did that." West Ham pulled out of talks to sign former QPR captain and free agent Joey Barton this week following protests from fans. But Bilic said the fans' reaction was not the only factor in the decision not to give the 32-year-old midfielder a contract. "It was altogether. Not just one thing. "We were thinking about Joey and I like him as a player. We discussed, we had some talks and ideas about him. But after that we decided, and Joey also, not to do it. "It was not the best timing." Watch more from Slaven Bilic on Football Focus, Saturday 15 August at 12.15 BST on BBC One and online.